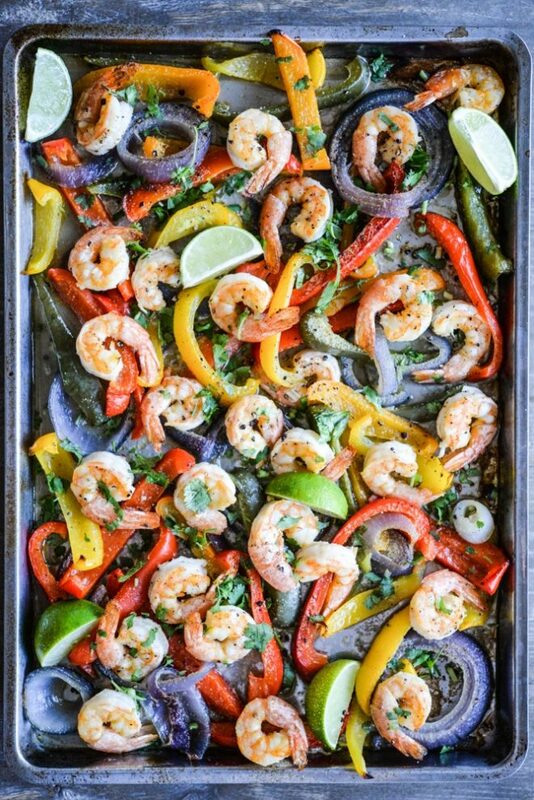 This Shrimp Fajita Sheet Pan Dinner will help you get a flavorful, colorful, healthy dinner on your table in no time! Getting back into the swing of story-telling, today I'm sharing the story of how Gus chose us! Shrimp fajita goodness follows shortly thereafter. Our 4 year-old Great Pyrenees, Gus, is a unique, floppy, special boy. He's admittedly one of the most spoiled, pampered, and catered-to 100+ pound animals on the planet …but that's why he chose us. My family holds firm to the belief that our animals choose US. They all have their own story of how they found us, too. My mom's first miniature schnauzer, Max, was the ugliest, most scraggly, grumpiest little dude you'd ever laid eyes on. He'd had a rough start to life and was pulled from a massive flood in Houston, TX. My mom, who worked for the Humane Society at the time, took a liking to the gnarly guy. She was the *only* human Max would let come near him – so, she took it as a sign that Max had chosen her. She scooped him up while my dad was away on a business trip (a lovely display of ask for forgiveness vs. permission), showered him with love, and within a year, the neglected pup blossomed into one of the most loving, loyal, entertaining members of our family. We're all so grateful Max chose my mom. Flash forward many years later, my then boyfriend (now husband), Austin, and I decided to visit a no-kill shelter near College Station, TX. Though the puppies and small dogs living in the inside kennels were cute, I was drawn to the large outside pens. I caught sight of a giant white bear of a dog. Walking over to the sweet animal, he was the only large dog who didn't bark or shy away. He took me in with his great big brown eyes and leaned into the fence hoping for a little human contact. This great big sweet boy both broke and expanded my heart. I hadn't ever seen a dog like him and I feel deeply in love. We left the shelter that day and the great big boy haunted my thoughts. A few days later, I called the shelter back to find that he'd been adopted …he wasn't our pup, but he was the first Great Pyrenees mix I'd met. My search for Gus (or Gus's search for us) officially began. Gus was born on a ranch in South Texas along with 10 other brothers and sisters. His mom and dad were hard-working ranch dogs, defending the flocks from coyotes at night. The litter of pups were meant to help populate the next generation of ranch hands, but a few of the pups were made available to close friends and family. The ranch owners were the parents of a friend from college and, as luck/Facebook would have it, we were able to connect and they invited me to come visit. Long story made only slightly longer, I *thought* I was in love with one of Gus's brothers. His brother was a brute of a dog, the largest in the litter. I SO wanted that little puppy to show me attention, but all of my attempts at wooing his puppy heart failed. That little boy wanted nothing to do with me. Great Pyrenees are pretty independent dogs, so I rationalized the behavior as natural. It wasn't until my mom tapped me on the shoulder and pointed at Austin (my then boyfriend, now husband) in another corner of the yard that I took in another alternative. The only puppy showing any person any attention was the one at Austin's feet. All my mom had to say was “it seems like that one over there has chosen Austin.” Knowing in my heart that Austin was the man of my dreams and knowing how important it is to let our puppies choose us, I walked over to meet our new family member. Far from his hard-working ranch dog roots, Gus has blossomed into an important part of our family. I can't image life without the sweet boy and I'm so, so thankful he chose us. 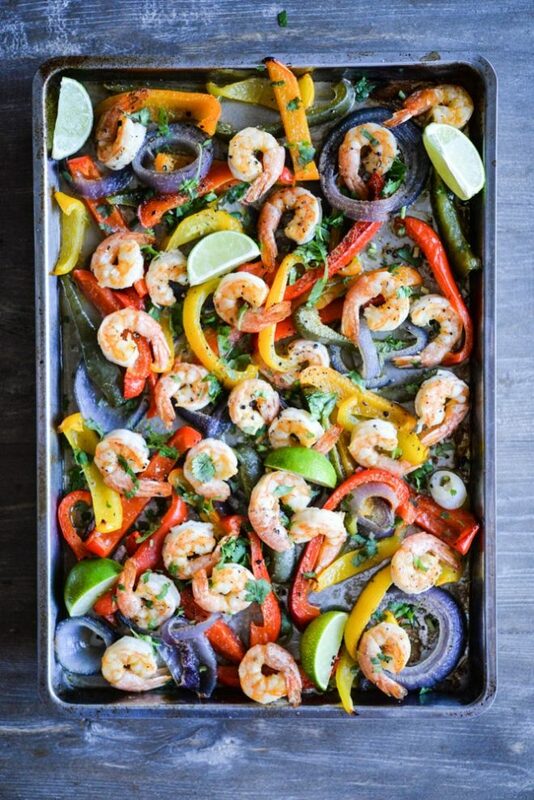 For this particular Shrimp Fajita Sheet Pan Dinner, know that you have a couple options. Option 1 involves baking the veggies first for 35 minutes (because they take longer), then adding the shrimp on top to cook for an additional 10 to 15 minutes. This method will result in shrimp that aren't overcooked, but it does call for an additional step. Option 2 involves baking the veggies and the shrimp at the same time. Know that this method, while it calls for less steps, may result in shrimp cooked more to some folk's taste. The call is yours to make! 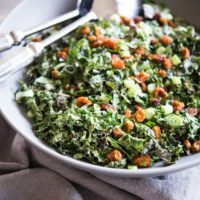 I hope you have fun with this dish and make it your own with the vegetables you enjoy most. 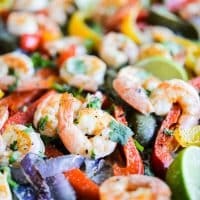 Place the peeled shrimp in a bowl and add the lime juice for a marinade. Add just enough water to cover the shrimp completely, stir, and set aside for 20 minutes. 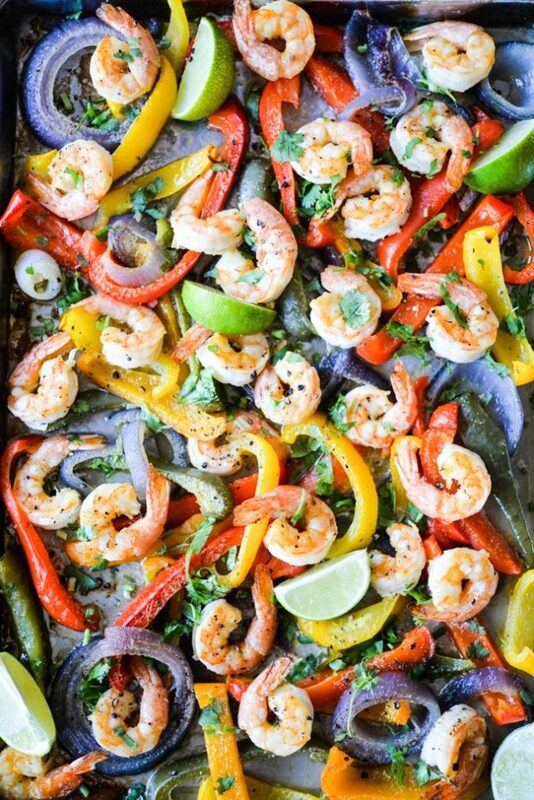 In a large bowl or directly on the rimmed baking sheet, toss the peppers and onion with 2 tablespoons of the olive oil. 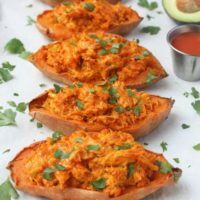 Spread the veggies out onto the baking sheet. When the shrimp are finished in their marinade, drain and toss with the remaining tablespoon of olive oil. Option 1: Season the vegetables with about half of the garlic powder and half of the sea salt. 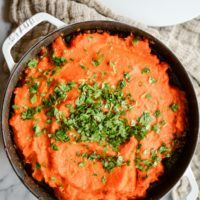 Bake the vegetables at 375 F for 35 minutes, or until wilted but not browning. 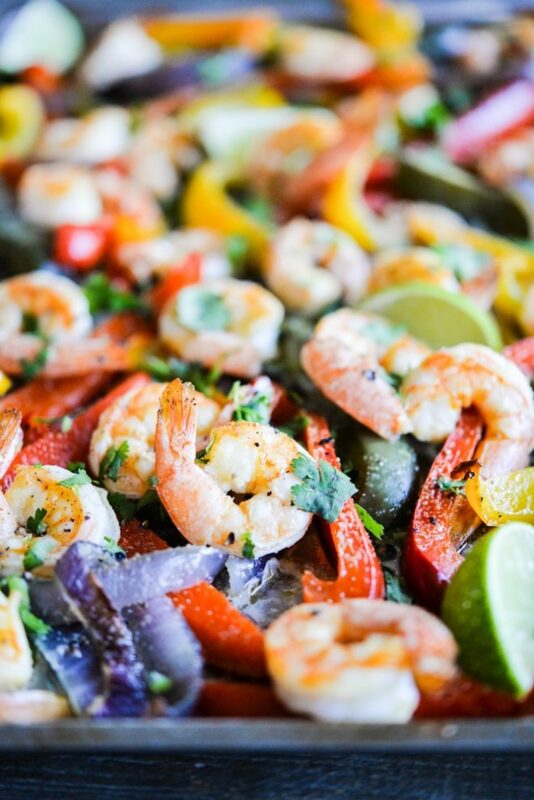 After 35 minutes, add the shrimp to the sheet pan by placing them directly on top of the vegetables. Season the shrimp with the remaining garlic powder and sea salt. 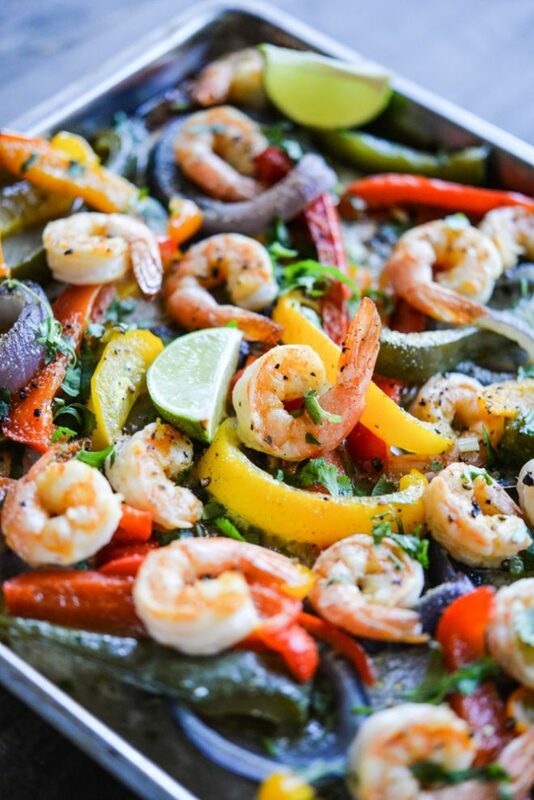 Return the pan to the oven for an additional 10 to 15 minutes, or until the shrimp are cooked through. Option 2: Once the vegetables are spread out on the rimmed baking sheet, place the shrimp directly on top. Season the entire pan with the garlic powder and sea salt. Bake at 375 F for 40 to 45 minutes, or until the peppers are wilted and just starting to brown. 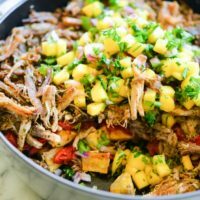 To serve, garnish with the cracked black pepper, fresh cilantro, and lime wedges. This kind of made me tear up! Dogs are such a special part of our families, my husband and I love ours so incredibly much, and he is also very spoiled! I love the perspective of your dog choosing you, when we went and “chose” our little guy, he was the one who kept running back and snuggling with me, and that’s how we decided he was the one we wanted to bring home! we want to see Gus pup pics! The snap of him after the groomer had me cracking up.. also love your Gus voice. Ok, I am obsessed! !